OpenWebRX is a relatively new software application specifically for listening to On-Line SDRs using a web browser. It is a web based server and interface for remotely accessing RTL-SDRs and SDRPlay's. The software was written by Andras Retzler, an open source enthusiast, engineer, and radio amateur. He wrote OpenWebRX for his Bachelor's degree in electronic engineering for his thesis. Andras published his thesis for all to read. You can download it here. It's very good! Here are some selected YouTube Videos I recommend that you watch on OpenWebRX. Want to listen to my RTL-SDR right now? Click the image above to give it a try. Hopefully, you clicked on the image above and listened to my RTL-SDR. But there are so many other SDR's available from SDR.hu. There are well over 90 available SDR's! Are you interested in sharing your SDR receiver so that others can listen in from all over the world? You can go to OpenWebRX to get the instructions. I also listed them below. They are from Andras's blog page. This is what I followed to set up my server on my Raspberry Pi. Linux commands are in Yellow. There is a configuration file config_webrx.py that needs to be updated so that you can craft the page to your requirements. Itr took me a while to figure things out but once I did, everthing turned out very nice. Here are excerpts from my config_webrx.py file that i hope you find helpful if you set up your own server. receiver_device="RTL-SDR + Ham It Up"
Because I'm using the NooElec Ham-It-Up upconverter and I wanted to display the frequency at 80 meters, I had to configure a different center frequency and what center frequency would actually be displayed. Why is this. The Ham-it-Up uses a 125MHz LO mixer to upconvert to a frequency that the RTL-SDR dongle receives on. The RTL-SDT frequency range is 25MHz-1750MHz. In order to get the 80 meter 3 MHz signal received, the upconverter mixes the 3 MHz signal with the 125 MHz LO such that the 80 meter signal is now received up at 128 MHz. In order for me to serve the SSB portion of the 80 meter band (3.75 - 4.00 MHz), I set the center frequency to 128,880,000 Hz. That allows me to cover the majority of the SSB portion of the band. 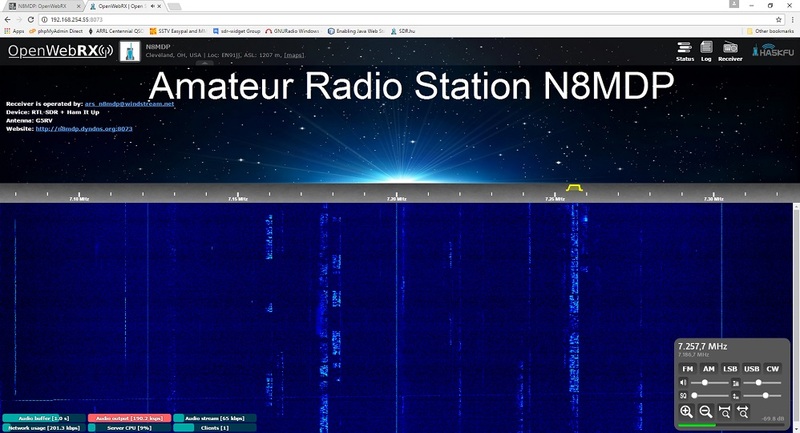 The end result is the webpage that serves my SDR for the 40 meter band that I chose.